Mon Projet Quebec Update | New Quebec Skilled Worker Program Application Intake Dates - Gateway to Canada | Canada Immigration Consultancy! You will no longer have to wait indefinitely as to when the Mon Projet Quebec will open again to accept new applications for the Quebec Skilled Worker Program. Accordingly, applicants who have already created their Mon projet Québec account may submit their application between June 13 and 20, 2016. The maximum number of applications to be received during this period will be raised to 5,000. 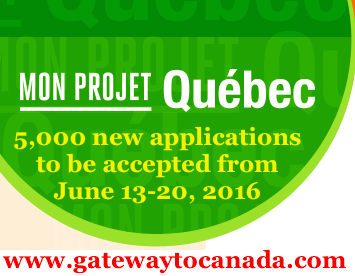 Those who have already created their Mon Projet Quebec Account may submit their application between June 13 and 20, 2016. And from 2,800 quota, it is now increased to 5,000. It looks like those who were not able to create account before February 16, 2016 will not be able to submit application for this intake schedule. But they may create one after the first 5,000 quota is reached. Let's just wait for further announcements from MIDI. One thing is certain now, despite the setback, MIDI will push through with the online application and paper application will no longer be an option.